Global oil markets will continue to re-balance this year as a pick-up in demand from refiners absorbs record output from several Persian Gulf producers, the International Energy Agency predicted. Refiners around the world will process record volumes of crude this quarter as their intake rebounds after falling in the second quarter by the most since 2009, the Paris-based adviser said in its monthly report. That will shrink brimming crude stockpiles even as Saudi Arabia, Kuwait and the United Arab Emirates pump at all-time highs amid competition between OPEC nations to secure market share, according to the agency. Rebounding demand will “help pave the way to a sustained tightening of the crude oil balance,” said the agency, which advises 29 nations on energy policy. Oil’s recovery from 12-year lows reached in January faltered in early June as inventories of both crude and refined fuels remained bloated, demand growth weakened and U.S. oil explorers began to resume drilling. OPEC, which has been pursuing a strategy to maximize its market share rather than defend prices, said it will hold informal talks about how to stabilize prices on the sidelines of a conference in Algiers next month. Refiners’ crude processing this quarter, known as throughput, will increase by 600,000 barrels a day from a year earlier to a record 80.6 million a day, according to the agency. Throughput sank by 480,000 a day between April and June amid a glut of fuels like gasoline that refiners had churned out earlier in the year while taking advantage of cheap crude prices. The IEA increased the supply outlook and saw weaker demand growth next year compared with last month’s report. 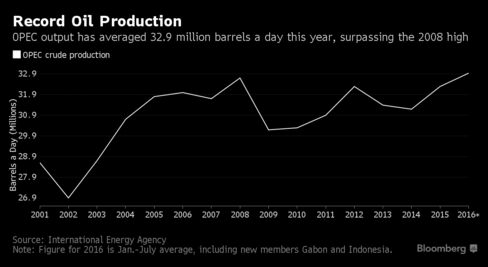 The agency trimmed forecasts for world oil demand growth in 2017 by 100,000 barrels a day because of a “dimmer macroeconomic outlook,” projecting that consumption will expand by 1.2 million barrels a day to average 97.5 million a day. It also boosted estimates for supplies from outside the Organization of Petroleum Exporting Countries by 200,000 barrels a day as Kazakhstan starts its long-delayed Kashagan project. Output from OPEC’s 14 nations roses 150,000 barrels a day last month to an eight-year peak of 33.39 million a day. Production in its biggest member, Saudi Arabia, climbed to a record 10.62 million a day as the kingdom raised output to satisfy domestic power consumption, which peaks during the summer with surging air conditioning use. The kingdom reported an even higher level in its data submission to OPEC for July, at 10.67 million a day, according to a monthly report from the organization published on Wednesday. Production in Kuwait and the U.A.E. also set new highs in July, at 2.87 million daily barrels and 2.97 million respectively, the IEA reported. Oil inventories in industrialized nations climbed to a record of more than 3 billion barrels in June as stockpiles of refined products expanded by more than four times the seasonal average, making up for a decline in crude stocks, the agency said. “The massive overhang of stocks is also keeping a lid on prices,” the IEA said.